Last week, I watched The Food Network’s Melissa d’Arabian make a Spicy Butterscotch Pudding on her cooking show, Ten Dollar Dinners. 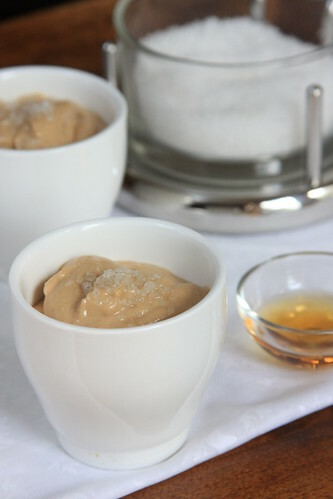 Until I saw this, my opinion of butterscotch was meh, but turned into something I suddenly needed in my life, so I put on my vegan thinking cap and came up with this recipe. The end result was a beautiful golden-colored pudding, with an incredibly silky texture and a subtle scent of whisky. A modest sprinkle of coarse sea salt over the top upon serving transformed this pudding into a perfectly balanced fall dessert. In a medium-sized saucepan, melt the Earth Balance over low heat. In a medium-sized bowl, combine 1 cup of the soymilk with the cornstarch and Ener-G and whisk until there are no lumps left. Add the mixture to the saucepan with the melted Earth Balance and whisk until well combined. Increase the heat to medium-low. In the same medium-sized bowl, combine the remaining 1/2 cup soymilk, creamer and sugars. Whisk until there are no lumps left. Add that mixture to the saucepan and whisk frequently. Once it comes to a small boil, remove it from the heat. Serve with a sprinkle of the coarse sea salt. OMG! This sounds soo amazing. I used to love butterscotch pudding as a kid but the whiskey flavor must really take this to another level. Awesome! It looks so creamy and thick. Yum! This sounds most delicious! That sounds amazing! I have missed butterscotch pudding, and I cannot wait to try this! This looks amazing! everything is better with some whiskey in it! So happy you liked, Leila! I don't really like drinking whisky, but I think it tastes so nice in desserts!